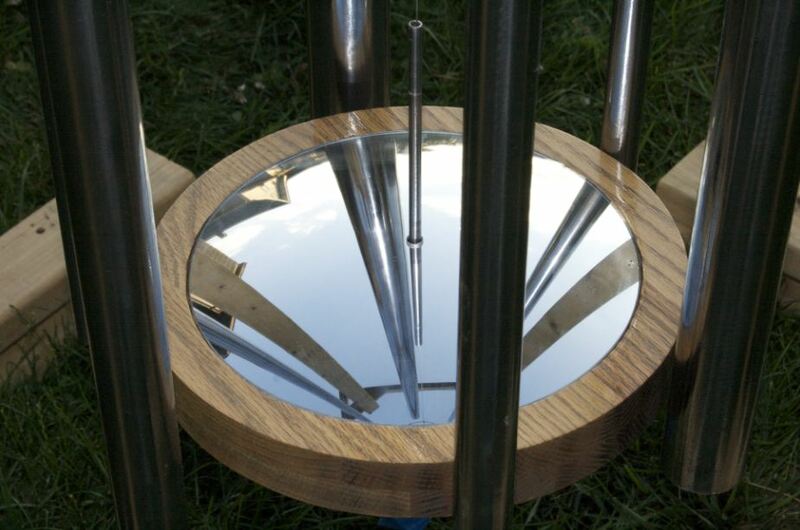 Serenade is an exhibition that taps into the history of chimes as tools for healing, meditation and communication. In this sound-based exhibition artists and musicians have been invited to re-think and re-structure these ancient instruments to extend their tonal and symbolic range, pushing beyond traditional scales, forms and materials. Serenade is intended both to seduce and to console anyone within earshot of Terrain Exhibitions. Tempestt Hazel is a curator, writer and co-founder of Sixty Inches From Center, an organization that archives, promotes and collaborates with artists and arts projects across Chicago. In addition to the upcoming exhibition at Terrain Exhibitions, her upcoming projects can be seen at the Arts Incubator in Washington Park, The Salon Series Projects and the South Side Community Art Center. Jeff Austin is an artist and musician who is currently studying sculpture at the School of the Art Institute of Chicago. His practice revolves around a persistent attempt to find reconciliation between the disparities in his relationships to urban and natural spaces, using collections of the various detritus found in each environment as a material base in the construction of sculpture and site-specific installation. He has recently exhibited work with Dock 6 Collective, Manifold Chicago and MDW Fair. In the past year, he has completed residencies with ACRE Projects and the Mormyrid Artist Residency. Originally from St. Louis, MO, Rob Frye is a wind instrumentalist and percussionist whose work approaches sustainability and environmental consciousness. He founded Flux Bikes in 2009 to experiment with bicycles as musical instruments and as instruments for social change. Rob advocates cycling by riding his bike to every Flux Bikes performance, even on longer tours spanning hundreds of miles. In March 2013, he led a group ride from Austin, TX to New Orleans, LA with a solar powered sound system in tow that allowed him to perform anywhere with a drastically low impact. Past performances range from the City Museum in St. Louis, to non-profit bike shops in California and Louisiana, and music venues and festivals in Chicago. Ramah David Jihan Malebranche is an interdisciplinary artist with a concentration in new media, sound and music. Originally from the mountains of Haiti, he is the proud father of one and perpetually juggles projects in several different mediums. Currently, he fronts Wooden Rings, an acoustic chamber pop quartet who records and tours frequently in and around Chicago. As a teaching artist he focuses on sound design, synthesis MIDI Systems, music appreciation and music theory. He received his MFA in Interdisciplinary Arts and Media at Columbia College Chicago. Stephen Lieto is a musician, maker and Program/Production Coordinator for the Chicago Humanities Festival. Lieto’s natural affinity for sound compels him to experiment with any instrument he can get his hands on and find music in the most unexpected of materials. Most recently, his work has been featured in productions at Steppenwolf’s Storefront Theatre and on the recent album of Being Beings. Originally from Houston, Texas, Viktor Le is a transdisciplinary artist whose work is rooted in unpacking and decentralizing the perspective of Black male identities. His practice often takes the form of performance, collage, video, sound and installation. After graduating from Fisk University in Nashville, Le moved to Chicago where he currently studies Interdisciplinary Arts at Columbia College Chicago. Michael and Yhelena Hall are an interdisciplinary collaborative duo who together make work that utilizes the basic environmental elements to transform spaces and create immersive installations. Michael works in sculpture, video, and performance to embody a crude reproduction of self and self-worth. Michael’s work often questions the value of time, labor, and the endless desire for capital gain, which ultimately become monuments to the mundane. In 2013 he received his MFA in Sculpture from the Art Institute of Chicago. Yhelena is interested in the process of transformation and uses various raw and manufactured materials to explore the relationship between space and identity. Hall’s intricate structures employ natural phenomena to evoke contemplation of common architectural forms. Yhelena received a Fulbright Scholarship to obtain her MFA in Sculpture at the State University of New York at New Paltz. Their work has recently been shown at The Mission Projects in partnership with ACRE Projects, the 2013 MFA Exhibition at the School of the Art Institute of Chicago and the Milwaukee Avenue Arts Festival.